Rome is where it all started. It was spontaneous. It was magical. We fell in love with Rome from the minute we set foot in it. Also known as ‘La Citta Eterna’, Rome, has something to offer for everyone. I have never met a single person who has been to Rome and didn’t feel the need to go back. Rome is sophisticated, classy and stunning all year round. A city for everyone, irrespective of age, gender or interests. No matter how many books you read or movies you watch, nothing will prepare you for this visit. Undoubtedly, Rome, is one of most beautiful cities in the world. Every year, it attracts millions of tourists from across the globe who travel to admire the architecture, history and masterpieces. With a mixture of cultures from all around the world, Rome has it all. The eternal city has plenty to offer in terms of restaurants, nightlife, shopping, entertainment, history and culture. It makes the ideal Summer vacation. Roam around the mesmerizing streets of Rome with a gelato in hand, find the most hidden bars or coffee shops and admire all the incredible architecture the city has to offer. Rome has no shortage of beautiful museums, but one of the most famous is the Vatican Museum. We visited the Vatican Museum early morning, on our first day. We read so much about it that we simply couldn’t wait to see it with our own eyes. The entry ticket for the Vatican Museums entitles the visit to the Museums and Sistine Chapel solely on the day which the ticket is issued. The Vatican Museum hosts centuries of artistic and historical treasures. It is nearly unthinkable to visit Rome and not even walk around one of the most visited monuments in Italy, the Colosseum. What an experience. The Colosseum is a symbol of the eternal city and the whole of Italy. It is not only important for its size and beauty but also for what it represented in Ancient Rome. We took a guided tour, something we rarely do, but we don’t regret it. This was most definitely the highlight of our trip to Rome: amazing and breathtaking place to visit! It’s mind-blowing to think how much skill the Romans had to create something so exquisite so many years ago. It is by far one of the most aesthetically pleasing monuments we have ever seen. Considered as the largest Baroque fountain in the world, The Trevi Fountain is admired worldwide. 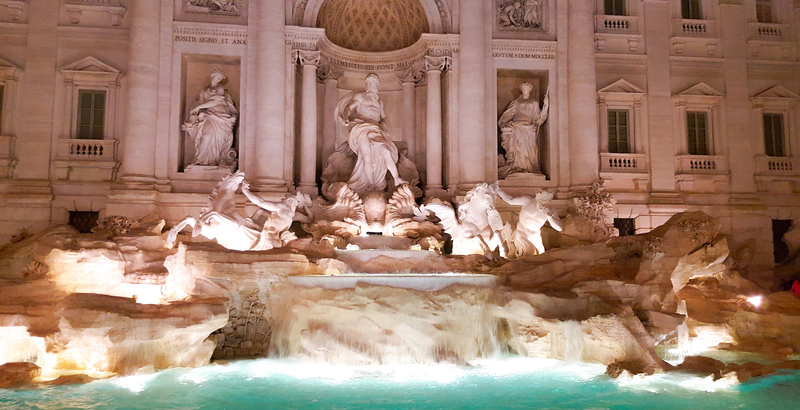 A traditional legend holds that if visitors throw a coin into the fountain, they are ensured to return to Rome. And if you have a passion for Italian food, Rome is definitely the city for you. Roman cuisine is loved for being extremely simple, tasty and satisfying. Traditional dishes in the Italy’s capital city have their roots in ‘poor man’s food’ and very often only a few ingredients, in creative ways, are used. Rome is ideal for pizza and pasta lovers (like us!) , so the first thing that comes to mind about Roman cuisine is probably its mouthwatering pasta such as the Carbonara, Cacio e Pepe and the epic Amatriciana. Rome serves pizza fit for the gods. From the simple Margherita to more adventurous pizza, pizza is definitely a must. For some reason food tastes better in Rome, the ingredients are so simple yet so tasty. You can never get enough of Italian food. After spending a week in Rome, we can quite honestly say we have never been captivated by another city in our life. Apart from our never-ending love affair with Italian food, we fell in love with the people. Whether you have a chat with the sales person, your waiter or hotel receptionist, you can be sure to receive some Italian hospitality.We can assure you that you will never feel unwelcome in Rome. Even if you don’t consider yourself as a museum fan or have a passion for history, you can’t help to be in awe of the history of this this city. Rome is very compact. You can walk to all top sights very easily (just prepare comfortable walking shoes), which is very refreshing. Rome is an ideal city for a romantic getaway or long weekend trip.